How Do Microscope Digital USB Cameras Work? Wirelessly broadcast to up to six devices the microscope image. Connect the camera directly into a computer. Connect the camera and project the image to an LCD projector from a computer. You can learn more about the wireless WiFi enabled microscope camera option here. Most microscope digital cameras have a USB cable that connects directly into a computer or laptop. Once the camera is plugged into the computer and the included software is opened on the computer, it is possible to view a live image on the computer screen. The software allows image capture, motion video capture, and measurement. The camera is mounted on the microscope in one of two ways. Either with a c-mount adapter on the trinocular (camera) port, or by mounting the microscope USB camera directly over one of the eyepieces. The image above shows some options for connecting microscope USB cameras to the microscope. 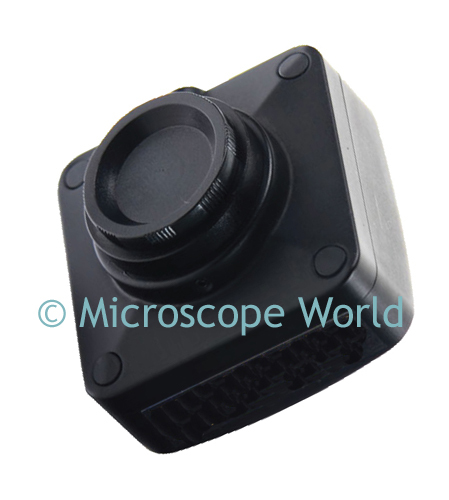 The most common way to connect a microscope camera is with a c-mount adapter on the trinocular port as shown at the bottom of the image. 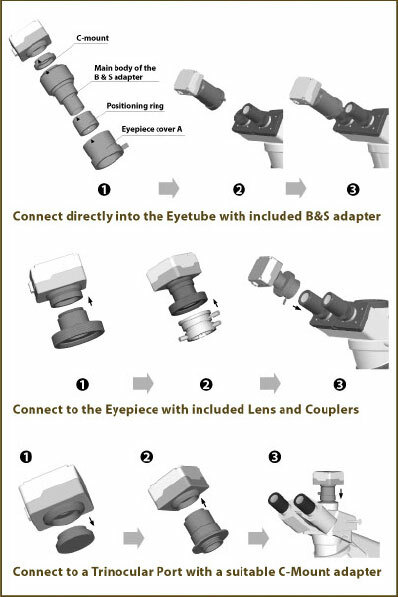 C-Mount adapters are microscope specific, you can learn more about microscope c-mounts here.